What is School-A-Thon’s R.E.A.C.H. Program? Included with our Color-A-Thon programs is our fun and interactive R.E.A.C.H. program. A collection of daily life lessons for students to learn and discuss – all leading up to your event. 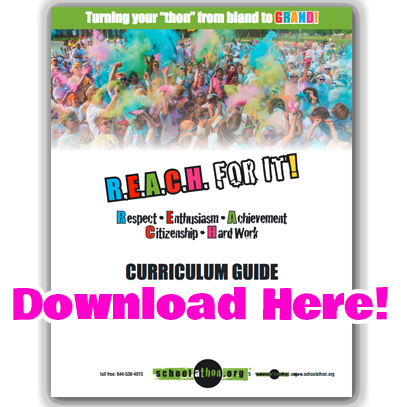 We have a downloadable curriculum that walks teachers or administrators through each step, with examples and follow-up discussion points to get the kids on the right track of life. Check out our FREE, life lessons program which teaches kids their importance in the world and how they can have a positive affect on it. Our full length curriculum will guide you through each step and includes discussion points and recommended books to support each step. Listen to our Daily “R.E.A.C.H. For It!” Announcements!